Take advantage of the best value ever offered on TV or the Web. This $59 value is yours for only $19.95. It contains the newly enhanced Magic Putty, 30 Day Money Back Guarantee and 2 free gifts when you order today. Magic Putty is great for anything from your smallest craft projects to your largest home improvements! 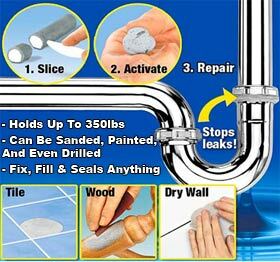 Magic Putty is the easy way to fix, fill, hold and seal almost any surface, and make it last. Magic Putty can be molded to any shape, sanded, painted and even drilled into! This amazing super-powered epoxy can be molded into any shape and applied to almost any surface for a long everlasting bond. Leaky PVC or copper pipes, broken ceramic cup handles or shoe heels – no repair job is too big or too small. Fast-acting epoxy has the muscle to support up to 350 lbs! You get 12 oz. sticks, gloves and instructions. The wall in my classroom is made out of concrete, painted white. Nails aren't going to go in it, at least I am not going to try. My students have won so many plaques and they just sat in a corner, until I found this product. It didn't work at first, because I didn't mix it until it was a solid white color. But after I followed the directions, it worked fine. It is even holding up a 20lbs composite portrait!